what’s the big deal about naming your character? I mean, a name is a name, right? Everybody has one. Some are long (think, Winnifred Patricia Hinkleberry), some short (Ty Cook), some rhyme (Larry Berry), some even have the same first and last name (Jeff Jeffries). In real life, you may chuckle at the names you hear but probably don't give names much thought. Why should you take the time to choose a great name for your character? Whether you realize it or not, everyone associates names with people they know. What that means is that when they are introduced to your characters, your readers will immediately think of a person they know by the same name who is short, tall, heavy, thin, a class clown, conservative, outspoken, or obnoxious, and identify him or her with your fictional character. While you, as the author, can't possibly know the real people the reader will conjure up, there are some names that unavoidably have a stereotype attached to them. To test this theory, what’s the first thing that comes to your mind when you think of the following names? Mary, Joseph, Adolph, Judas, Madonna, Cher, Sybil. There are always exceptions and these names can possibly be used within the right story and setting. But chances are you wouldn't choose to name your Christian character Judas, because of the stigma that comes along with the name. Likewise, you might not name your wild, rebellious teenage character, Mary. You want to choose names that suit each specific character. Names depend greatly on the era in which your story takes place. For instance, it isn't likely that you would name your contemporary American character Helga or Bertha. Many years ago, these were common German names so if you were writing a historical novel set in Germany, these names would work well. According to Babynames.com, the top American names in 2007 included Emma, Madeline, Hailey, Ava, Olivia, Caitlyn, Jacob, Ryan, Caleb, Ethan, Aidan, and Connor. As you can see, some of the popular names today are actually classics, like Emma, Ava, and Jacob. Names tend to make the rounds and come back again decades later. If your character’s parents are involved in the story, consider what type of people they are, or were, when your character was born. If they were reserved and conservative, they might have chosen a classic name, such as Anna or Elizabeth. However, if they were an active part of the 60’s hippy generation, a name like Autumn, Lennon, or Sonny would be appropriate. On the other hand, if your story is contemporary and your character is young and hip, choosing a trendy name, such as Hailey or Madison might make her more believable to your readers. Also bear in mind the readers you are targeting. 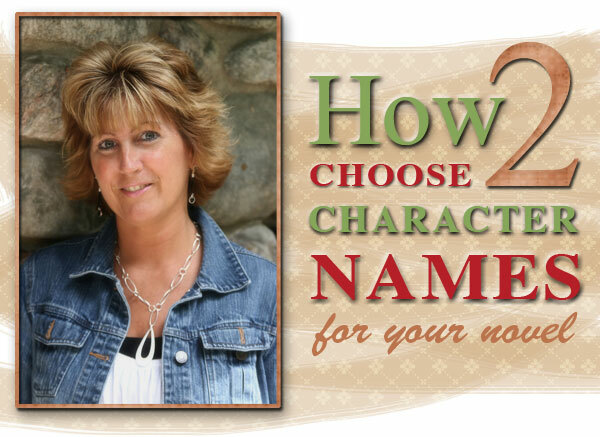 Choosing names to match the era your reader belongs to might make the characters more appealing. There are some famous names that, if chosen for your character, would immediately be laughed at and discarded by your reader (that is, if your editor would actually allow the name in the first place! ), such as Woody Allen, Clint Eastwood, Whoopi Goldberg, Goldie Hawn, or Bob Hope. Unless your character is introduced as having been named by parents who were obsessed with the actor, actress, musician, or sports hero, your reader would have a hard time identifying with your story. Other famous names could be used sparingly. There is no doubt that if you opened your local phone book, you would find a few people named Michael Douglas, Julia Roberts, Jackie Kennedy, or Steve Martin. These names could be used in your story, but perhaps consider a different spelling or putting a twist on the name so it doesn't appear that you, as the author, are obsessed with the actor or actress. Michael Douglas, for instance, could become Mike Doogles or Julia Roberts could be tweaked to become Julie Robertson. Of course, you could create a character with a famous name and make it a recurring joke within your story. If you’re like me, you may have a first or last name that is difficult to pronounce. The fact is your reader will probably end up skipping over the name altogether if she can't pronounce it. Say your character's full name aloud a few times. Does it roll off your tongue? Or do you find yourself stumbling and stuttering? Make sure the first and last name blend together smoothly. Once you think you have come up with a name that is easy to pronounce, double check by trying it out on family and friends. Now, take a look at the name you've chosen and think of all the nicknames that could be derived from it. If his name is Mike Carr or Stan Dupp, your reader might end up chuckling throughout your story. And unless that is your intention, you may want to rethink your character’s name. There are some names that are spelled the same but could be pronounced differently. If your character’s name is Meagan and you want it to be pronounced, Meegan, subtly point it out before your reader gets too far into the story. You don’t want the mention of it to be too overt so that it seems you are blatantly pointing out the pronunciation, but try to make it flow within the context of your story. Just as people associate names with certain people they know, how you spell it also plays a part in how the reader sees your character. For instance, some feel that Catherine, with a "C", is a more elegant name than Katherine, with a "K." This could be because the letter, K, is a harsher letter than the softer C. Do you think of your character as Zach, with the softer H, or Zack, a stronger sounding character with the harsher, K? What about Kurt or Curt? Today, spelling varies greatly from years ago. While years ago, Lindsay was a common spelling, today, you have Lindsey, Lyndsay, Lyndsey, Linsey and even Linzy. Many names that typically ended in "y" have been varied to end in an "i" like Madi, Patti, Cindi, and Ami. Using an “I" is considered a more cutesy variation that you may want to consider when naming your perky, teenage cheerleader. Whichever way you choose to spell your character’s name, you'll definitely want it to be in a way you will remember as you are writing your novel. It might become a problem, not to mention time consuming, if you have to keep going back to confirm spelling. Names that rhyme, such as Jerry, Sherry, Carrie, and Larry. Variety is always a good thing. A colorful character roster not only makes your story more interesting, it helps the reader keep them straight in her mind. Keep track of your characters as they are introduced. When a new character needs a name, you’ll easily be able to tell which names to avoid and which are okay to use. Phonebook – Your local phonebook is sure to provide you with a few (thousand) names you’ll love. The Bible – The Bible is loaded with many unique names. Just keep in mind that some are difficult (if not impossible) to pronounce. Internet – Do a google search for “baby names” or “random name generator” to help you along. Soap operas – There is no doubt the soaps are loaded with interesting characters. A few well-known soap names include: Victor Newman, Erica Kane, Reva Shayne, Lauren Fenmore, and Bo Buchanan. Try mixing them up to come up with names like, Victor Shayne and Lauren Buchanan. Movie credits – Hang out for a minute after the movie has ended and watch the credits roll. Producers, editors, actors, and casting directors provide lots of great names to get your creativity flowing. Keep a running list of names with you at all times. When you hear or see one you like, jot it down. Then, when introducing a new character in your story or novel, and you’re stumped for a name, refer to the list. Remember, a name is the first thing your reader will encounter in the story to help him or her identify with your character. Make an effort to choose names that not only are identifiable but memorable, too. Lynda Schab works as a freelance writer as she pursues her dream of becoming a published novelist. Her work has appeared in Blue Mountain Arts and DaySpring greeting cards, Christian Home & School magazine, over ten anthologies and dozens of ezines. Her fiction has earned her various awards, including second place in the chick lit category of the 2008 ACFW Genesis contest, finalist in the chicklitwriters.com 2007 Get Your Stiletto in the Door contest and Highly Commended in the FaithWriters 2007 Page Turner contest. She is currently on the home stretch of finishing her first novel, Mind over Madi, a contemporary Christian Mom-Lit.